For CareerBuilder, HR Tech 2015 would be one of the most important trade shows of the year. The firm wanted to use the world’s largest Expo of HR technology products and services to showcase their line of comprehensive and user-friendly HR software. In addition, a totally new “look and feel” would be making its debut at the event thanks to the recent corporate rebranding. At DesignCentrix, we’ve had a partnership with CareerBuilder for almost nine years. Three months from the show opening, they reached out to us to brainstorm their HR Tech goals, budget and timeline. 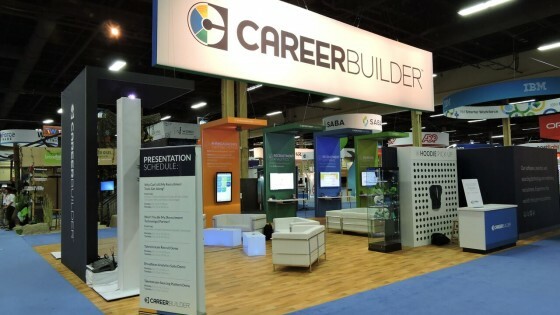 CareerBuilder planned to make software demonstrations the main focus of the exhibit, with the objective of reaching 500 demos/leads during the show. Achievement of that goal became a vital component during the booth layout and design phase. The new “look and feel” was also a major consideration, making sure CareerBuilder’s new brand was presented correctly and all materials were consistent across the board. 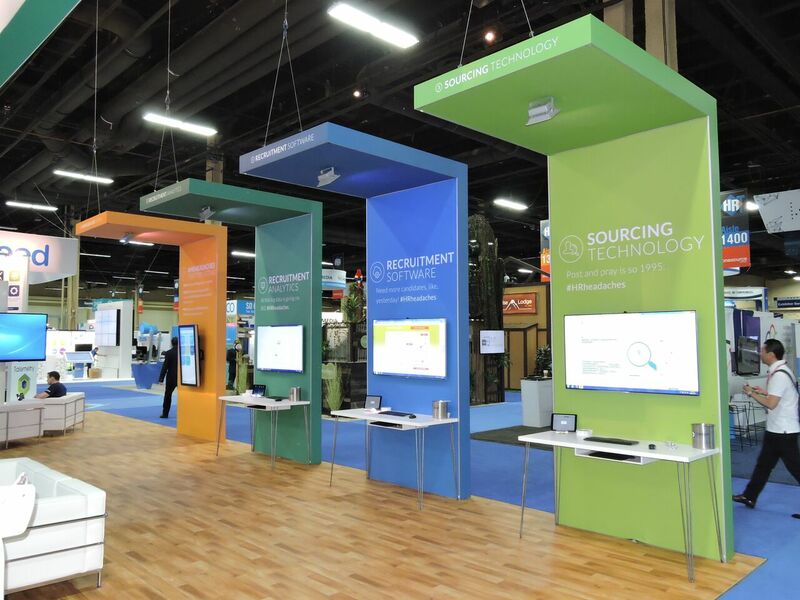 DesignCentrix soon presented inspiration boards based on CareerBuilder’s needs, and they were thrilled with our approach to their 30’ x 50’ exhibit. The exhibit design was sleek and new, with passageways that allowed attendees to easily enter, find their way to one of four demo stations, and depart smoothly to make way for others to enter. The creative vision was discussed and tweaked and the building soon began. (#HRheadache, Recruitment Analytics, Recruitment Software and Sourcing Technology). A presentation area with a raised podium, seating and high resolution viewing screens completed the exhibit. When finished and assembled on the show floor, the exhibit was not only stunning…it was incredibly effective as well. 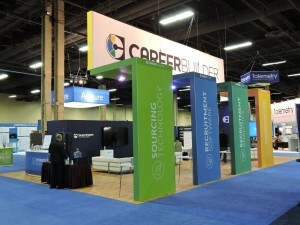 CareerBuilder exceeded its goal of 500 demos/leads and met with many more prospective clients.